Thin and crispy toasted nori sea vegetable snack baked for just a few seconds and seasoned with natural sea salt. Convenient and delicious on its own, with sushi or sprinkled over salads. Toasted nori sea vegetable* (62%), rapeseed oil*, sunflower oil*, sea salt. 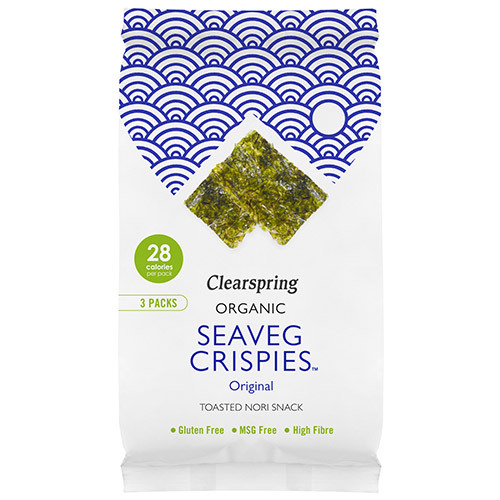 Below are reviews of Clearspring Organic Seaveg Crispies - Original - 3 Pack by bodykind customers. If you have tried this product we'd love to hear what you think so please leave a review. Absolutely gorgeous. Never had seaweed crisps before and I was very impressed with how filling these are. A nice alternative to regular crisps (which I no longer eat) I have a pack every other day and they are thoroughly enjoyable.